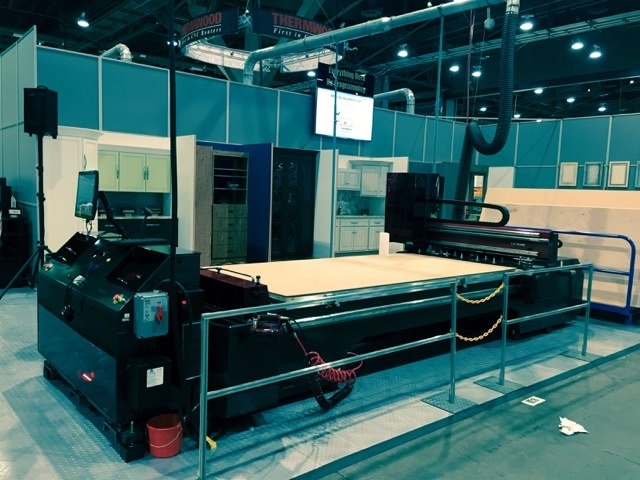 Experience the award winning Cut Ready Cut Center at the AWFS Show July 19th thru 22nd in Thermwood's booth #9200. New for AWFS 2017 are "Single Pass MDF Doors" that offer a wide variety of door styles and profiles. The Cut Ready Cut Center also includes a number of new control features making it even easier to use. No programming--no learning CAD/CAM or CNC code--just tell it want you want to make, load the material, and let it make the parts for you! Letting you create Single Pass Doors much faster versus Multi Pass Doors. 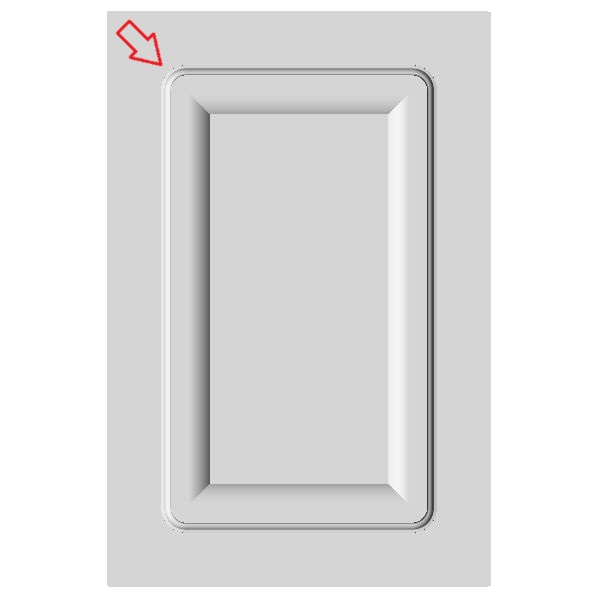 You can choose to leave the inside corners as a radius, or have Cut Ready clean them out automatically. 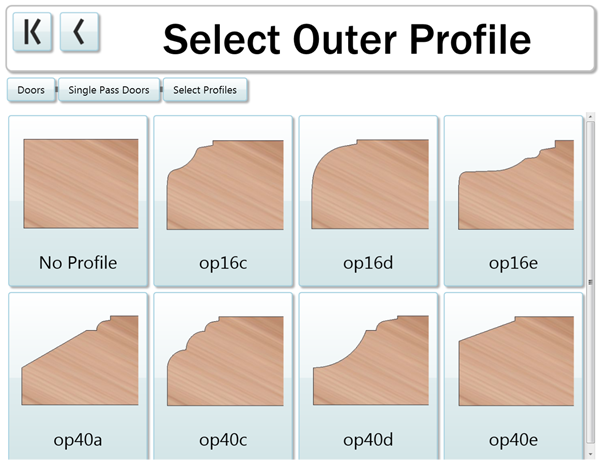 The Cut Center can also help narrow down which door to use by selecting only the profiles you want. 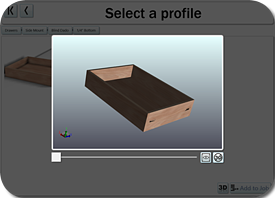 The matching drawer fronts are automatically shown. Another new added feature is the addition of both flush bottom and overhang doors to frameless uppers. 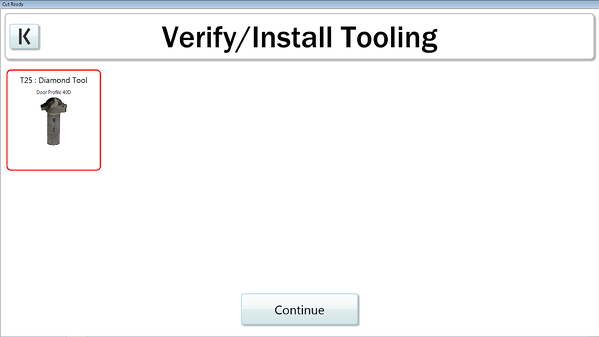 The Verify Tooling interface has been updated to be easier to use and more specific (only displaying mandatory tools). We've also made the Cut Center even more accident-proof. 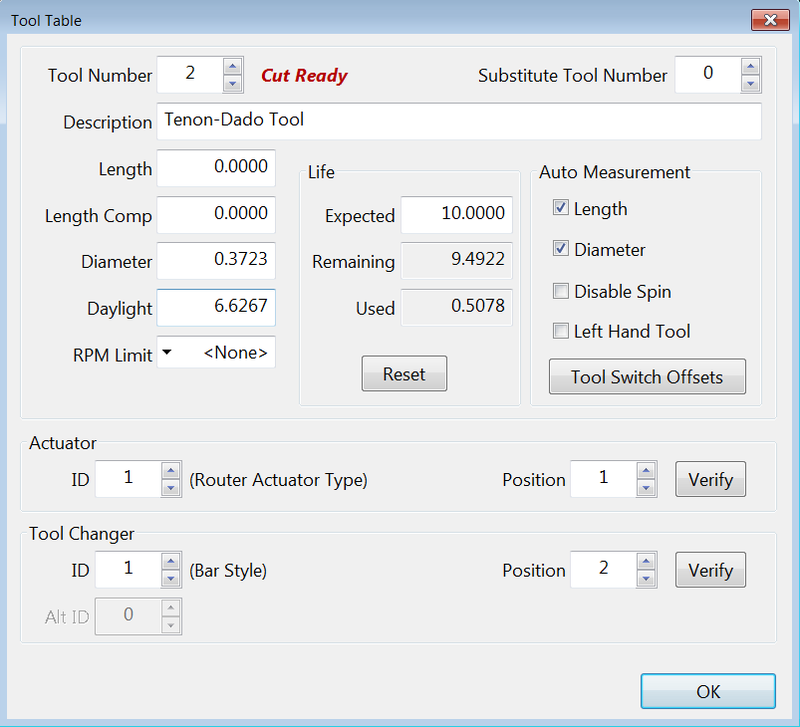 It now monitors any tooling changes made while in CNC Access. If you forget to change a tool back or if you changed something in the tool table, the Cut Center will automatically verify those tools prior to cutting. The latest kitchen design trends are demanding that solid wood and MDF doors appear in the same space with multi-colored cabinet layouts. This reality has challenged door makers to produce MDF doors that resemble solid wood profiles. Production limitations have traditionally made it impossible to make MDF doors on a CNC router that match solid wood doors made on traditional moulders and tennoners. 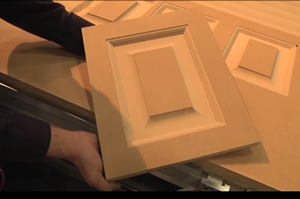 Advancements in MDF door tooling design and related software packages have made it possible to machine MDF doors on a CNC router that could pass as solid wood. A cohesive combination of smart tool design, flexible software, and proper material can produce an MDF product that is almost an exact match to solid wood once the door has been finished and installed. The application is possible, but does require some critical tools and design strategy to achieve a door with tight corners and good surface finish that can be primed with minimal sanding. There are a couple of problems that must be overcome before achieving success. Shows the current possibilities of MDF profiled doors on a CNC router. Notice the detailed moldings and small radius on the corners of the inside profile that can be achieved. In previous years, a simple profile made from a single pass with a profile tool would create a rounded corner affect that made it obvious to the customer that the door was made from MDF and machined from above with a CNC router bit. Detailed moldings and tight corners were impossible, if not very inefficient to produce. The key to this issue is as much software related as it is tooling, and any solution must include effective communication between tool designers and software programmers. The obvious solution to create a smaller radius in the corners is to use a smaller diameter tool. However, this can lead to dramatically increased cycle time which can be prohibitive from a production stand point. Primitive software made it necessary to have all tools do a complete pass around the door profile, but modern systems allow the smaller diameter tools to isolate all four corners after the larger profile tools have done their work. The key is to start with a large profile tool to remove the majority of material and then break up the profile into small sections, and design the smallest diameter tool possible to clean the corners. It is important to understand the limitations of the smaller diameter tools, and adjust feed rates and RPM accordingly to avoid tool breakage. The smaller diameter tools will often be designed with single flutes, so a drop in feed rate will also ensure better cut quality. Many small carving tools are better suited to solid carbide or carbide insert, rather than diamond due to design constraints. Any tool inventory must include larger diameter tools for maximum material removal at higher feed rates, and matching tools with the smallest possible diameter to perform critical detailed carving applications in the corner of inside door profiles. Flat surfacing on the inside door panels is notoriously difficult as tools tend to leave machining lines on the overlapping tool path. Depending on the fiber size in the core, tools can also pull fibers which creates a pitted affect that must be filled by primmer. If fibers are not sheared off, they tend to raise up during priming, resulting in additional sanding or priming required. There are some machine parameter adjustments that can be made to improve surface finish. Smaller chiploads will obviously provide less feathering of fibers, but excessively small chiploads will cause heat generation and reduced tool life, so feed rate reduction is not always ideal. The solution lies in the tool design and cutting edge geometry. The cutting edge geometry helps limit “overlap lines” between tool passes which reduces the amount of sanding required before priming. Up shear geometry helps extract large chip loads at higher feed rates to reduce cycle time. The diamond cutting edge is critical to providing prolonged tool life in difficult surfacing applications that produce excessive heat generation and cutting edge wear. To achieve optimal results, it is best to run multiple tool passes and leave 3-4 mm for the final finishing pass. Cabinet doors will always be the focal point of any kitchen, and generally require the most attention to detail. Proper tooling design and application can help ensure the customer’s expectations are met, but also ensure that production cycle times and finishing costs are controlled. Consult your tool designers to discover many creative ways to make your MDF doors look as good as wood. For over 4 decades Royce//Ayr has combined excellent customer service with state of the art cutting tool technology. Royce//Ayr started out in 1963 as “Royce Carbide Tools Ltd” a small local sharpening shop for woodworking tools. The company soon became involved in the design and manufacture of specialty saw blades and cutters. In the ‘80s and ‘90s Royce started to explore the many possibilities of Insert and PCD-Diamond tooling. 1997 saw the merge of Royce Carbide Tools Ltd. with Ayr Saw & Tool Inc., a manufacturer of HSS saw blades for metal. This merger added valuable experience to the new company Royce//Ayr Cutting Tools Inc. In 2003 the company moved to a new 40,000 sq.ft. facility at 405 Sheldon Drive in Cambridge, ON. As the industry is constantly changing and looking for better and faster ways to produce their finished products Royce//Ayr is committed to continuously investing in state of the art equipment and highly skilled employees to satisfy the demands placed on them. Browse through this web site and inform yourself of our capabilities to produce premium quality cutting tools to internationally accepted ISO standards. You can always reach our dedicated sales and engineering staff to help design and develop the best custom tools to meet your specific needs. With such excellent customer service and quality tooling, it’s no wonder that today Royce//Ayr is a leading manufacturer of cutting tools for wood, plastics, rubber and metal today. Royce//Ayr is committed to supplying customers with superior quality tools, excellent customer service and on-time delivery by employing cutting edge technology, tooling and machinery, and experienced dedicated employees. Why Choose a Cut Center? Thermwood has introduced our IWF Challenger's Award Winning “Cut Ready – Cut Center” as an alternative to CNC routers for making custom cabinets. 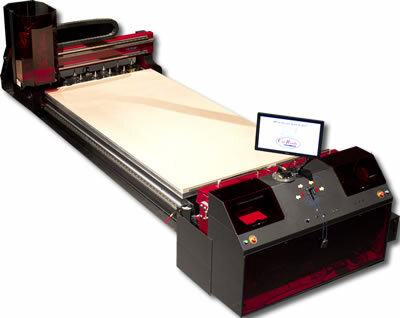 In this post, we ask two main questions: Why would you want a Thermwood Cut Center instead of a traditional nested based CNC router? Why would a major supplier of CNC routers introduce a new product that competes directly with its already successful products in this market segment? With the advanced technology available today, we at Thermwood believe that it’s time for something new…. something even better… something a lot easier, so after almost five years of technical development, we have released the Cut Ready – Cut Center. This system is clearly not a CNC router. It looks a little like a CNC router, but it doesn’t work at all like a CNC router. A machine capable of running those programs. It requires a significant effort to engineer, select, buy, install, learn, tool, program and operate a CNC router system. While many shops embrace this challenge, many others do not. A cut center consists of a single element, the machine. Everything is inside the machine, pre-selected, pre-installed and ready to run. There is no programming with a cut center. That’s right, no programming… none. A cut center actually knows how to make cabinets, allowing the user to make cabinets in about any way they want by just selecting the desired product. You simply tell the machine what kind of cabinet you want (face frame/frameless, single/double side material, toe kick/detached toe, etc. 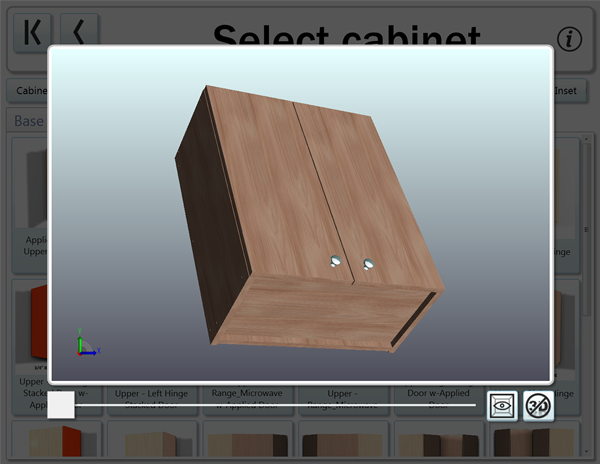 ), then select the specific cabinet from all the cabinets made that way and adjust the size. Installation of a cut center consists of connecting power, air and dust collection and you are ready to run production right away. The number of products you can make with a cut center is impressive. In addition to kitchen cabinets, there are closet, bath and utility cabinets and furniture (including book shelves, entertainment walls and table tops). You can also make drawers; side mount, undermount or slot slide, quarter inch or full thickness bottom, blind dado or dovetail construction. Simply tell the cut center to make drawers for the cabinets you cut and it does it - just that easy. It also makes doors and drawer fronts. There are over 450 designs for MDF doors and drawer fronts including square, arch, cathedral, slab and sophisticated applied molding designs with both raised and recessed panels. You can also make grain matched slab doors. 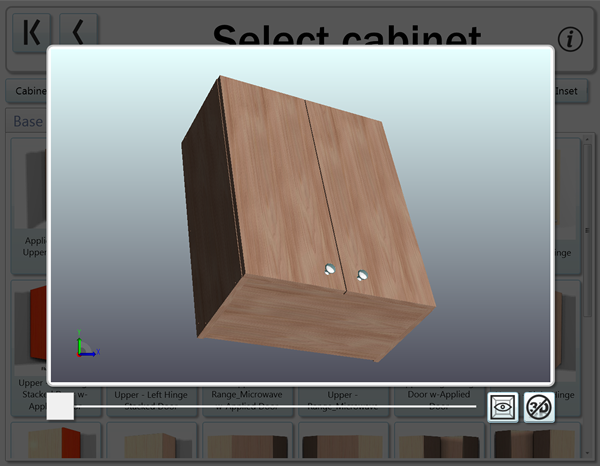 Just like with drawers, simply tell the machine to make doors for the cabinets you just cut and it does it. It even makes moldings, both straight and arched. Select from hundreds of profiles, resize the profile in width and depth and it makes it. It uses a reverse 3d printing technique for MDF doors and moldings where, instead of adding a small amount of material each pass, it removes a small amount. This means that everything in the system is made with a set of standard tools. Running the cut center is also different. 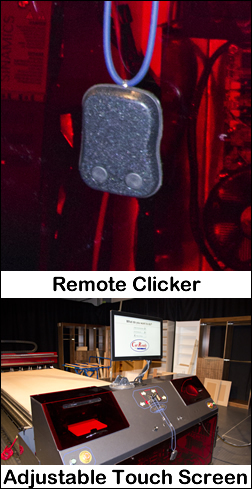 Everything is handled through an adjustable touch screen and a remote “clicker” you wear. Pretty much everything is handled automatically, tooling management and tool life, vacuum hold down and spoilboard management. All the operator does is follow step by step instructions. If needed, there is a “Show Me” video for every step. You can even call a real live person on the screen if you need more help. Why is a Cut Center for Me? One reason you might want a cut center is that it can be run by just about anybody. Another reason is that you can produce a lot of different products with no programming and almost no effort. Thermwood has invested thousands of hours developing, testing and refining these programs. To duplicate this for a CNC router will also require thousands of hours. There is also the smooth integration between cabinets, drawers, doors and drawer fronts. Once you cut the cabinets, you can make everything else by just telling it to make it for those cabinets.Another reason is that details in these cabinet designs, some patented, make assembly easier. Assembly marks machined into the joints show you which parts fit together and in which orientation. Alignment pin holes make installing drawers really easy. The machine will print detail step by step assembly instructions for more complex items like closet cabinets. It also prints a label for each part showing you which job and cabinet the part is for, which edges get edge banded and a bar code in case you need to re-make the part. Thermwood is continuously expanding the products our cut centers can produce, driven by feedback from users, and these new designs are available to all cut centers as a free download. System software updates are also available as a free download as they are released. The “Virtual Service” feature mentioned above is also available to cut center users for free. This is clearly a new approach. It is not for everyone, but we believe there are a significant number of cabinet shops that would rather make cabinets than program computers and so we created the Cut Ready – Cut Center. This is an informational breakdown on the cost of a cnc router to produce mdf doors as opposed to traditional methods of producing traditional five piece doors. This was put together by Bob Law, Regional Manager of CNC Automation (a Thermwood dealer). Most people equate nested based manufacturing with cabinet box components and the labor savings, added precision and ease of assembly that goes along with automation of this process, but a big part of a quality system is the machining of peripheral items. In my opinion and the opinion of large percentage of our users, the ability to produce "high end" paint grade MDF doors more than justifies their lease payment which in reality makes the cabinet advantages free. A large stigma attached to MDF doors is the customer's perception that MDF is cheap or a lesser quality in comparison to popular 5 piece doors (which if you think about it is clearly not the case). A large headache for a kitchen manufacturer is a call 6 months to a year after the install when the center panel has shrunk and the paint is cracked along the inside of their rails and styles, or the miters have opened leaving an unsightly gap in the corners of all of their doors. In most cases a customer will easily opt for a 1 piece MDF option if presented with the fact that their MDF door will stand the test of time and be guaranteed not to move and deteriorate the look of the dream kitchen that they have worked so hard for. Now all MDF door packages aren't created equally. Most systems have the ability to do single pass doors that look like the prototypical MDF door with an outside profile as well as a simple inside profile. 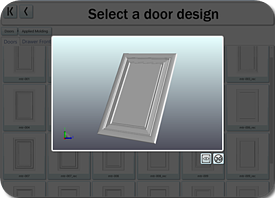 Our software, which is called Panelmetrix, has the capability to create multipass 1 piece doors, as well as automatic mullion and glass cutout machining. It can also create bead board machining, valance machining, 1 piece multipanel machining (which can be used for tall doors, wainscoting, range hoods etc...) and a number of other features that will turn door machining into an order entry system once a door style is developed. Panelmetrix is available exclusively to Thermwood owners and is the ultimate companion to eCabinet Systems. Added Gross profit for one kitchen = $2700.00 which in most cases will cover a lease payment for a Thermwood nesting system. In closing, the cheapest system on paper over a short period of time can be by far the most expensive. MDF doors coupled with modeled curved moldings, preprogrammed carvings, dovetailed drawer box machining, can all be easily machined with our system and for small to midsized shops especially, can make the difference between profitability or the addition of just another one dimensional tool in your shop. 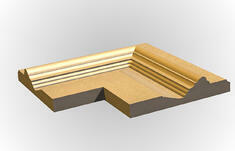 Please take the time to view a few typical examples of quality MDF door machining below.